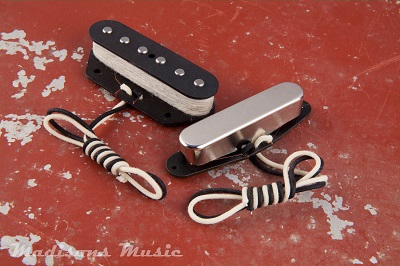 Our NOS style Pre CBS grey bobbin Telecaster pickups are based off that infamous 60's Telecaster tone. Slightly overwound in comparison to our 50's set. Hand wound Alnico 5 magnets and staggered poles. Poles have a beveled top edge. Our 60's Tele pickups offer that natural bell like tone you expect out of an early Tele. Nice noticable mid range and clear overtones.